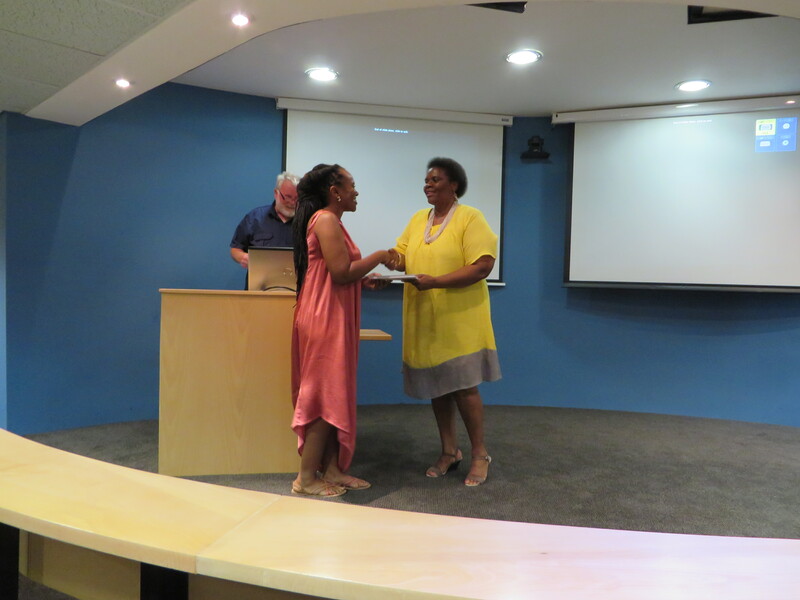 A very successful launch was held at the Merensky Library, University of Pretoria thanks to the organisation of Elsabe Oliver, Deputy Director of UP Library services supported by Ms Stella Ndhlazi NHC funding manager and Prof Emeritus Roger Fisher, acting head of Architecture UP. 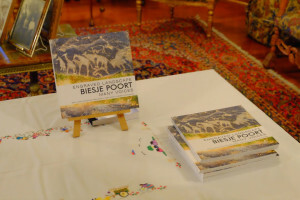 Prof Emeritus Fisher who is a co-editor, author and funder of Engraved Landscape Biesje Poort: Many Voices was the key note speaker at the event. The launch was held in the library’s auditorium and approximately 50 people attended. The MC for the event was Ms Elsabe Olivier and the audience was welcomed by the Director of UP Library services Mr Robert Maropa. 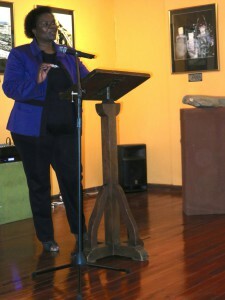 Ms Stella Ndhlazi, National Heritage Council funding manager addressed the audience regarding the NHC’s funding role. 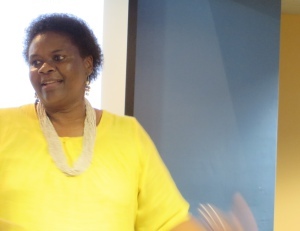 She noted that the book was one of the flagship projects of the NHC and that it was hoped that it could be translated into other languages so that as many of the population could read the research in their home language as possible. 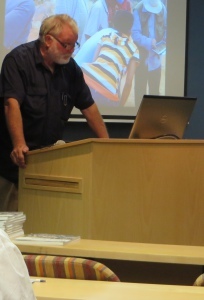 Prof Emeritus Keyan Tomaselli of the Centre for Communication, Media and Society, UKZN introduced the key note speaker. He gave some context to the project and mentioned that as a team effort Prof Emeritus Fisher had been a crucial participant as he had been a co-editor, author and facilitated the inclusion of UCT Landscape Architectural Department by inviting Ms Liana Muller Jansen to be part of the team. He also noted that Prof Fisher had used part of his personal research funds to ensure the success of the project by e.g. 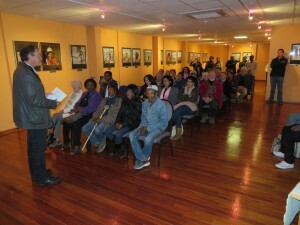 funding the proof reading trips to Cape Town and to the Kalahari participants. 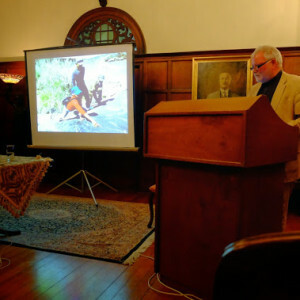 Prof Emeritus Fisher included background slides for his address. 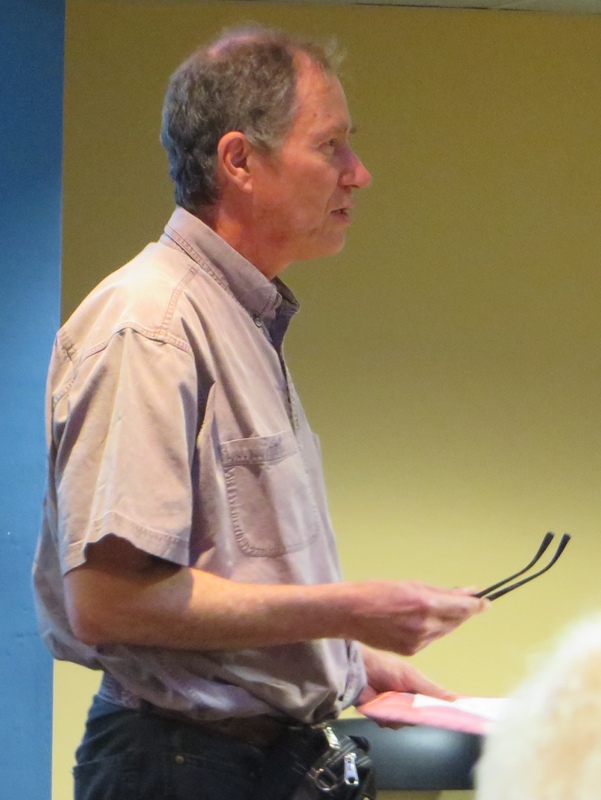 He emphasised the narrative and inclusive approach of the project and noted how this had influenced his thoughts on future built environment heritage recording projects. At the end of his address Prof Emeritus called upon Ms Miliswa Magongo to handover complimentary books to firstly Mr Thembelani Maso of the NHC. Ms Stella Ndhlazi accepted this on behalf of Mr Maso. 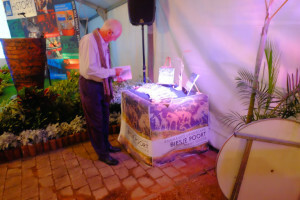 Complimentary copies were also handed over to Jonathan Noble, University of the Witwatersrand School of Architecture. Ms Stella Ndhlazi then handed over copies to the head of Tshwane City Museums of libraries for the city libraries. The Pretoria Book launch of Engraved Landscape Biesje Poort: Many Voices will take place on 22nd October 2014 at 14h30. 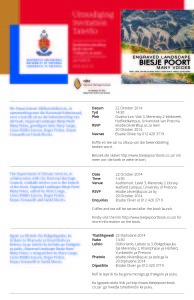 The venue is Merensky Library University of Pretoria. 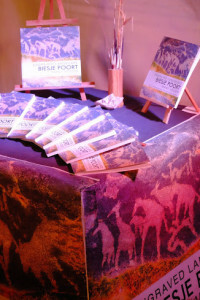 Tea and eats will be served after the launch. All are invited. The Biesje Poort project came about through a long family association with the Orange (Gariep) River in the region of Upington. Mary Lange, my sister and researcher in the Centre for Communication, Media and Society in the University of Kwa Zulu-Natal prepared a proposal for funding by the National Heritage Council, firstly for recording unrecorded rock engravings on the farm of Biesje Poort which is in the north-western catchment area of the Orange, thereafter the preparation of a publication to disseminate not only knowledge of the site, but also of the techniques employed, findings, and critical reflections. 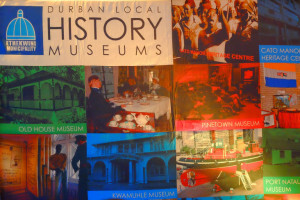 Since the proposal met their endeavor to support the heritage research sector, especially those that engage local communities, promote development, creates access to resources and treat all peoples with dignity and respect, monies were awarded to the research, and thereafter the publication. 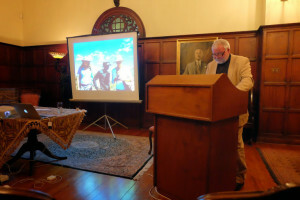 The researchers were a diverse team, being both interdisciplinary, as well as trans-cultural and diverse in the levels of education – from salted professors to wet-behind-the ears young Bushman with a standard five education. With diversity come certain disparities. 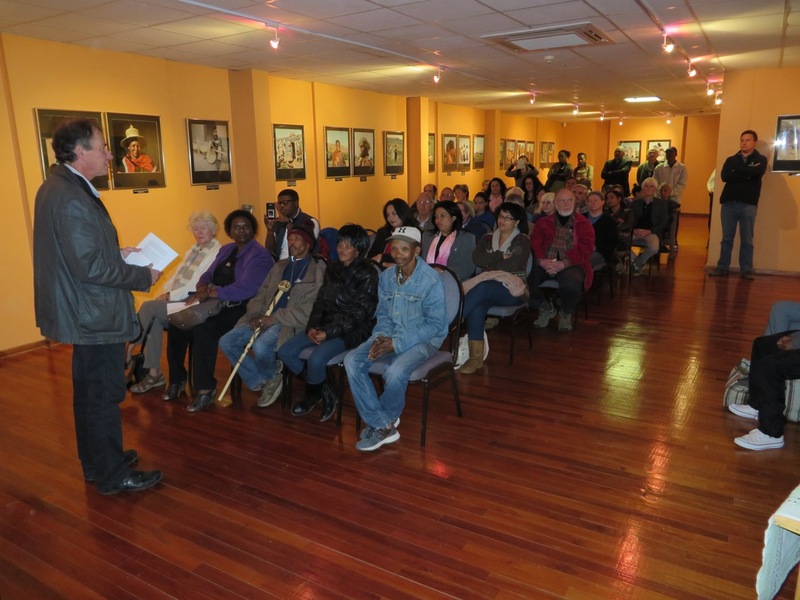 The inclusion of the local residents brought differences in the way persons were engaged in the project – academic researchers were either bursary students or salaried academics fulfilling their research mandate as part of their studies or employment. 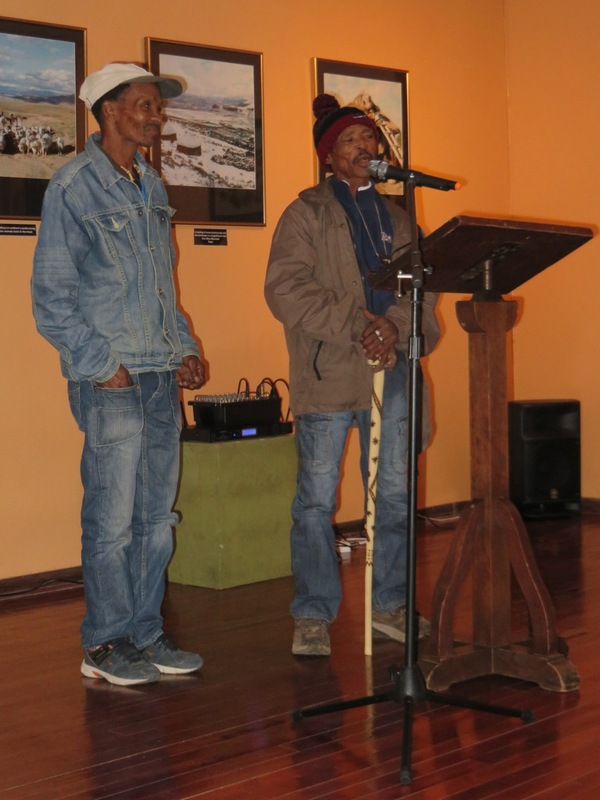 Local inhabitants – Bushman / San (the group we worked with prefer to be called Bushman or ‘Boesman’) – were employed and paid a daily allowance from the funding. This set into motion other mechanisms for checks and compliance – they were ‘First People’ who have special authority under dispensations of UNESCO with their own protective body – we had to assure an outside representative that neither they nor their heritage were being exploited. This was a fairly fraught meeting since although one would assume a certain unity of purpose; there were tensions in the group as to authority and validity of representation. Then also in the field labour legislation applies, for while academics and students may be prepared to go the extra mile, the team members ‘employed’ by the project had to be treated in accordance with the law, with stipulated hours, breaks and such like. The group had no lingua franca. The Bushman spoke Nama and Afrikaans. The academics were either uni-lingual English speakers, bilingual Afrikaans or English first language speakers or isiZulu or setSwati. Hence communication in the field needed translators – and sometimes things were lost in translation – there was much debate elicited around the discussions of the depiction of that which we believed to be a representation of a rhinocerous (my caution is from having been with archaeologists!) – The Nama speakers had not before seen this creature and did not readily have a word for it. There were interesting and anecdotal aspects to this particular project – Khamkirri, where we had booked to stay, had been recently flooded by the Orange and was under a layer of mud. The camp was opened especially for our use but still not restored to ‘normal’. We no sooner found our way into camp than we had high winds and torrential downpours, I waking up swathed in canvass and sleeping in a cold Jacuzzi! For the Bushman this boded well for our endeavors as rain is a blessing from the ancestors. 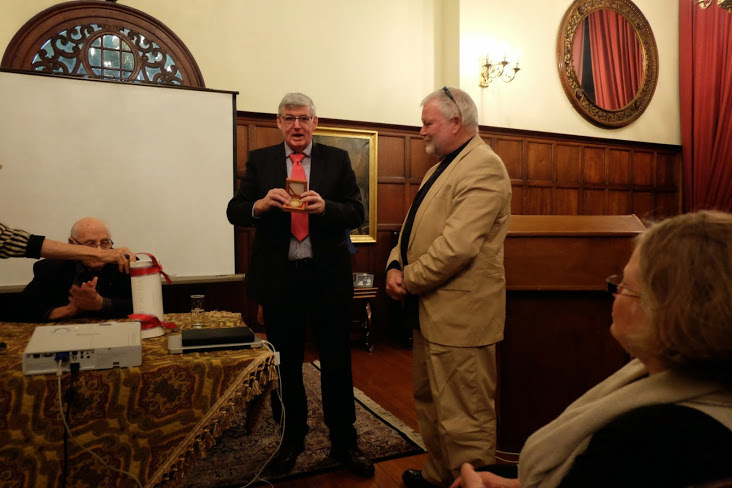 For some of us – well we were not so sure …! But the rain abated and the heat returned. Although it was not as hot as it could get it was more than hot enough for city dwellers. 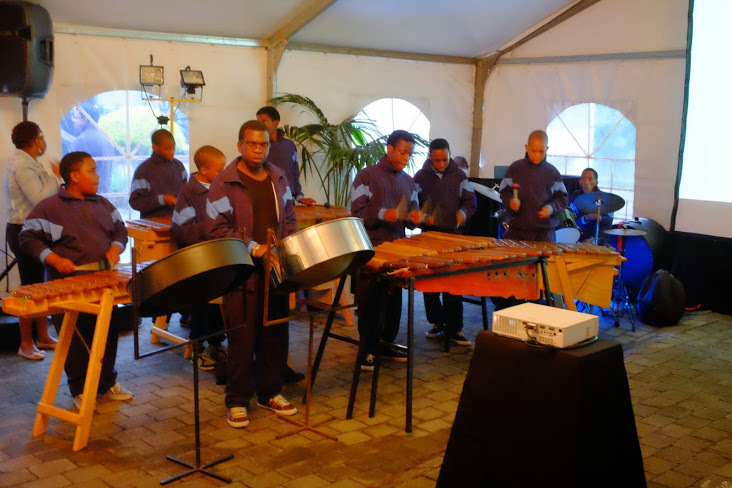 The Bushman thought us mad but there were deadlines and representatives of the funders were going to pitch to audit and do an on-site check, which they did! 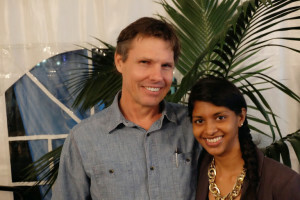 We take our connectedness over distance for granted. We were pressured to get the book to press in order to meet our funding deadline, which required one plane flight per editor in order to meet, compare notes, ideas and physical examples, but thereafter it was all done by drop box. 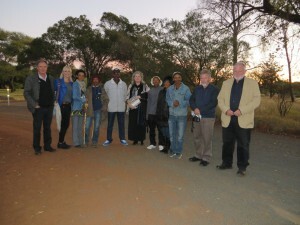 However our team members in the Kgalagadi had no such convenience for direct communication. There was nothing to it but to drive the few thousand kilometers once we had a proof manuscript to get their sign-off approval. I’m afraid my flawed Nama was an amusing attempt but after going through the texts and transcripts Izak Kruiper said ‘Ek hoor my stem. Dis eg en dis reg!’ [I hear my voice. It’s authentic and correct]. Why I have an interest in archaeological sites is because through habitation sites take on dimensions which we can associate with architecture – particularly in its abstract and conceptual concerns. Hence although there may not be built features but still the human presence and occupation and use of site shows embedded intelligence. I am a follower of Lethaby, more recently Norberg Schultz, and the resonance between the cosmic and architectural manifestation hold intrigue, since it makes universal the particularities – floor like the seas (or waters), ceiling like skies, roof like the heavens – and here it is exactly that. My colleagues from the landscape disciplines are interested in the spacial ‘reading’ of landscape – how natural features become directors of actions or movement – both from and towards. Many interesting discussions emanated from Bushman observations and ‘reading’ of the landscape and these are useful pointers for designers. What is of interest to me as well is how we animate the past in the present – we have different relationship to and claims on the engraved surfaces we documented – but through the activity documentation laid a claim of joint ownership. As a teacher of architecture I have an interest in visual thinking so the very process of documentation intrigued me – we see things not for what they are but believe them to be. In making tracings the closer one gets to the image the more indecipherable it becomes and the more likely one is to record features not intentionally there or conversely miss features depicted. Therein lies a lesson for those who do documentation of heritage fabric. Then the creation of narrative: Early recorders did so ‘scientifically’ merely counting and tabulating. But this is not good enough. We need a good story line. The Bushmen were particularly adept at this, the archaeologists the least so. 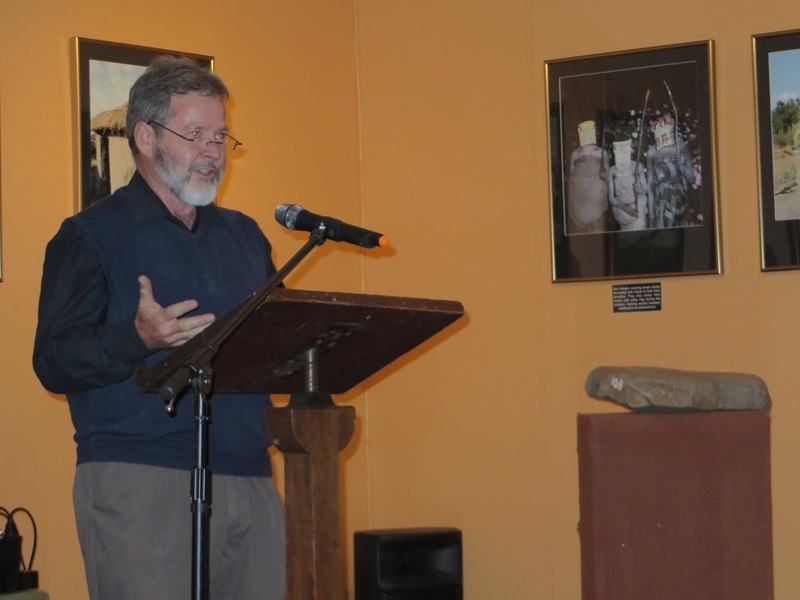 We speak of the multi-vocality of the project – there were many voices, many narratives, and a diversity of intelligences – each, under varying circumstances, has its validity. We have tried to record this in the book. I went into the project having just turned sixty. I’m supposed to be in my winding-down years but I found this a particularly inspirational project. I learnt a lot. Architecture still seems to me to have an exclusivity to the built environment as heritage. We come from a divided society and my sense in that somehow even in wishing to preserve this heritage we reinforce divides – built environment heritage is seen to be the preserve of the privileged. We need to find ways to engage with the fabric and narratives of these artifacts and tease out their multi-vocalities – through both finding the many narratives they represent but also making accessible their ‘mystique’ by investigating the palimpsest of their making. Of all artifacts buildings are least pristine and ‘authentic’, most are made by multiple intelligences and many hands and we need to find and make explicit these narratives and voices, the way they find and inhabit their place and space and how they become way-finders for the users of these places and spaces. These are lessons I bring from the desert and the remote rock engravings of the landscape at Biesje Poort. 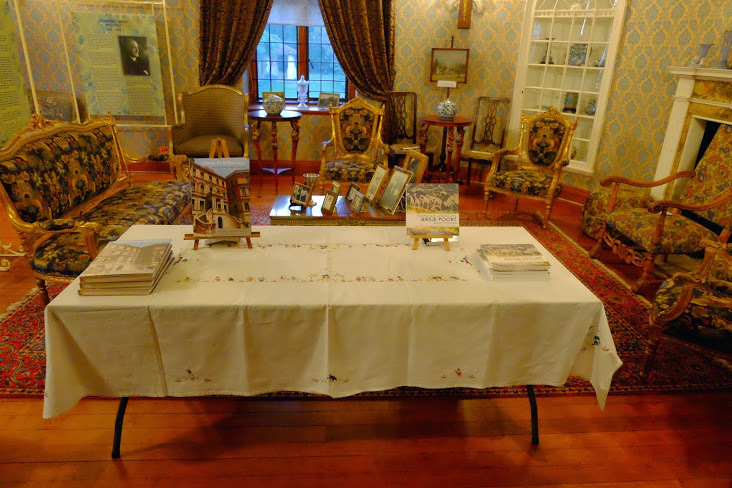 Many of the book team contributors, authors and editors attended the successful book launch and handover to the NHC funders on the 16th May 2014 at the Duggan-Cronin Gallery McGregor Museum. The launch was co-ordinated by Dr David Morris, archaeologist at the Mc Gregor Museum and a contributing author and editor of the book. The launch was very well attended and included speeches by Dr David Morris, Mc Gregor Museum; Prof Keyan Tomaselli, CCMS, UKZN; Stella Ndhlazi, Funding Manager, National Heritage Council and //Khomani Kalahari participants Jan Oeliset Org who spoke in Nama and Izak Kruiper who acted as interpreter. 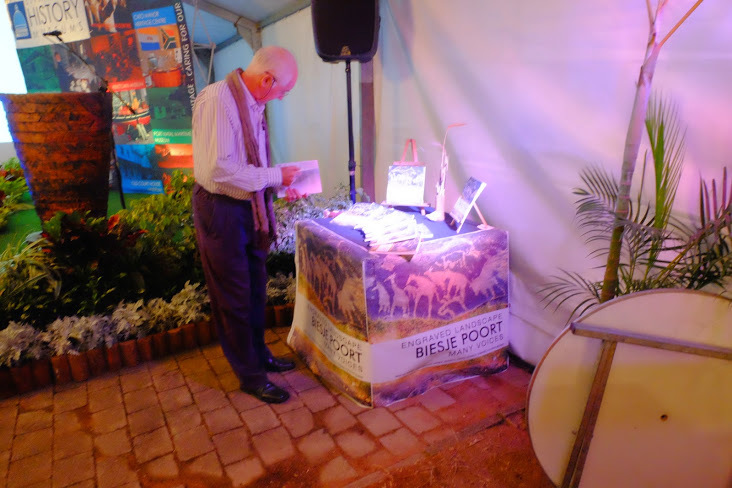 A number of books were donated on the evening to organisations and institutions including 40 copies to the Northern Cape Libraries for their satelite libraries. 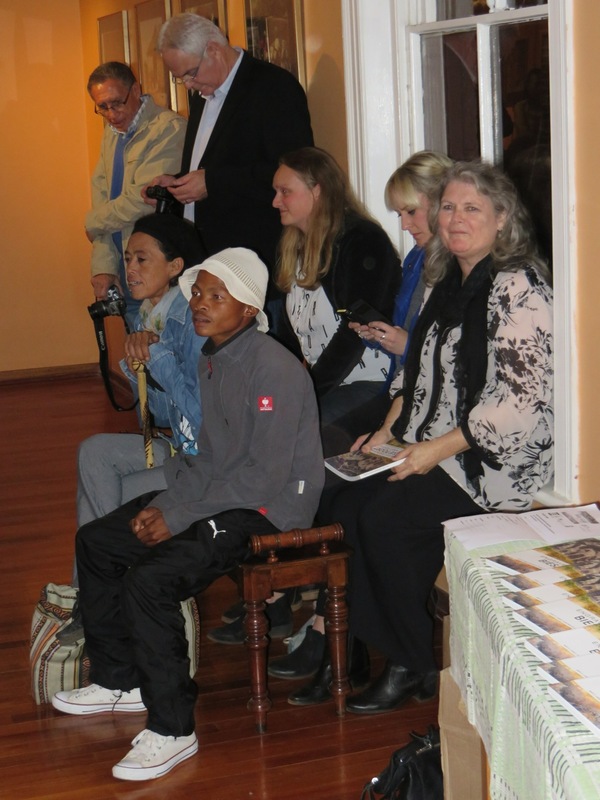 //Khomani Kalahari participant Lydia Lys Kruiper handed over the books. 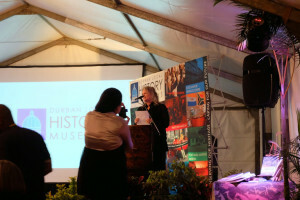 The event was funded by the National Heritage Council. Sponsorship of accommodation for the //Khomani participants was made by the Protea Hotel Kimberley. 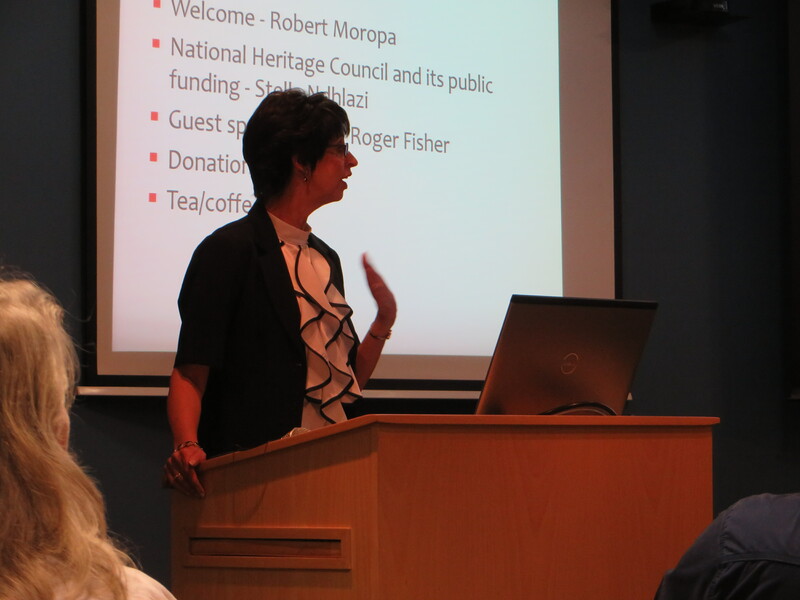 Prof Emeritus Fisher also assisted with funding of transport and accommodation.